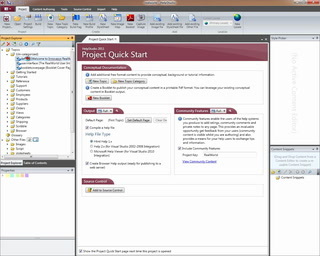 In addition to the Project Explorer, HelpStudio includes a number of additional tools to assist with organizing your Project Content. Quickly and easily add new nodes to the Table of Contents using the Table of Contents Designer. Create nodes that link to Topics in your project or to Internet Urls. Use Drag and Drop to add Topics to the Table of Contents from the Project Explorer, or to organize existing Table of Contents nodes. 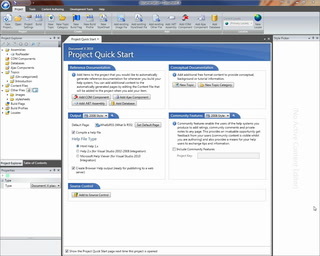 Open the Table of Contents Designer in a document window to simplify dragging and dropping from the Project Explorer. This movie provides an introduction to working with the Table of Contents (6 mins). The Project Index Editor gives you a project wide view of your Topic index keywords, allowing you to easily spot missing keywords, create new Keywords, add Topics to an existing keyword or remove redundant ones.